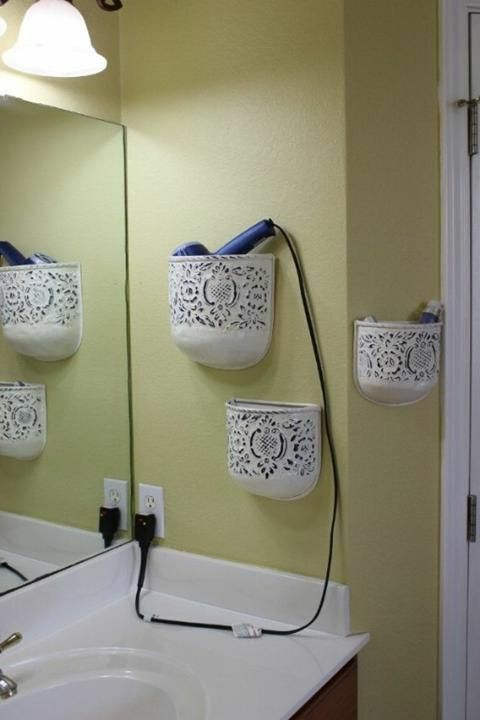 This homeowner opted to transform plant holders into storage areas for her blow dryer and other bathroom essentials. She mounted three onto the wall, which fit the interior design style of the rest of the room and even helped free up cabinet space. If your shower doesn't have any built-in shelving, simply use a hanging organizer, which drapes over your showerhead and gives you additional space when your tub lacks wide ledges. This way, you'll have everything you'll need while you're in the shower, from shampoo and conditioner to shaving cream and body wash.
An organized bathroom ... what a treat! Traditional cabinetry is essential to keeping your bathroom organized. Group items into categories, like shaving products, makeup, medicines, perfumes, nail care items, etc., to make them easier to find. If you have the space, organizing your makeup into groups like eyes, lips, face, etc., is even better! If you have a pedestal sink, you don't have any under-counter storage. Make the most of this space by placing a large basket under the sink filled with towels and any other tools you may need. Check out our Houzz ideabook for a couple of good ideas we like, then tell us: How do you organize your stuff??? We love to hear new ideas.